Manila, Philippines - Property values are increasing around the globe - and with a buck to be made, the number of global real estate billionaires is also rising. Nowhere is this trend more pronounced than in the emerging markets. 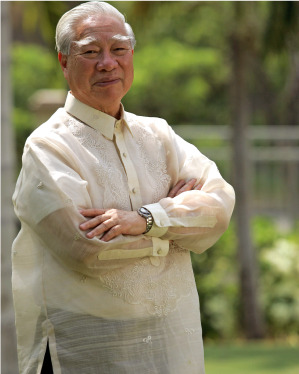 Statistics from Forbes’ Magazine’s Billionaire List 2014 reveals that Andrew Gotianun, a Chinese Filipino entrepreneur is among the top real estate billionaires. Malik Riaz, a Pakistani real estate investor has net worth of worth $1.1 USD billion while Wang Jianlin, the wealthiest person in China has more than $15 billion net worth. Andrew Gotianun is the founder and chair of Filipino real estate conglomerate Filinvest Development with $1 billion net worth. Shares in the company comprise more than 90% of Gotianun's net worth. Gotianun serves as both the Founder and Chairman of the growing conglomerate with interests in property, financial services, sugar, hospitality and utilities. Among other things, Andrew took banking arm East West Bank and has recently entered the hospitality industry with the Crimson Resort and Spa in Mactan, Cebu and Crimson Hotel Filinvest City. Filinvest was shortlisted for the $425 million expansion of the Mactan International Airport in Cebu. But Filinvest objected after a rival company offered the highest bid, citing a conflict of interest. The infographic reveals some further surprising figures about property’s super-wealthy. 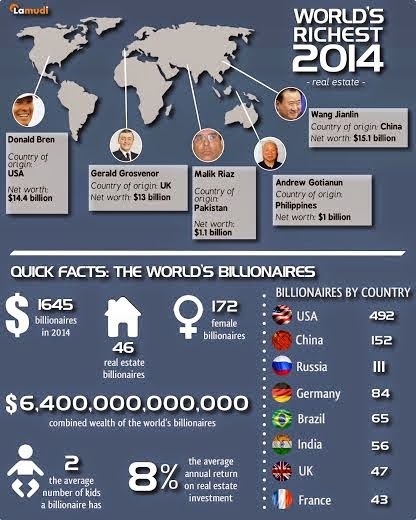 Of the 1645 billionaires around the globe, just 46 made their fortune in real estate. However, Lamudi Co-Founder and Managing Director, Paul Philipp Hermann, said this number was rising rapidly: “As property prices rise in booming markets like Pakistan and the Philippines, so does the number of ultra-rich real estate tycoons.